Stay up to date with the latest Ubuntu news and developments. The OMG! Ubuntu! 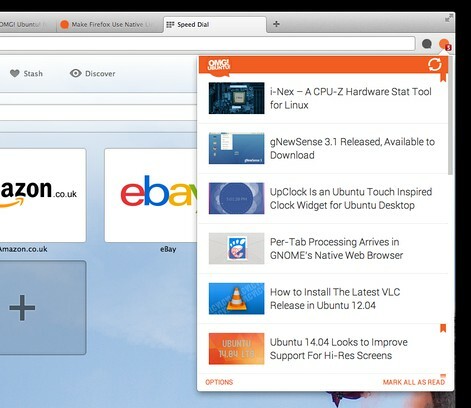 extension adds a button to the Opera toolbar that displays an unread badge when new items appear on the site and displays a pop-up notification bubble - though this can be turned off in 'Options'. Click the OMG! logo to view scrollable, drop-down menu with the latest posts from OMG! Ubuntu!. Unread items have a red 'bookmark' logo to the left. To mark all posts as a read click the 'Mark All As Read' text at the bottom the extension window. To mark an item as without reading simply left-click near its thumbnail. Or, to read it, click the link to go straight to the post on OMG! Ubuntu!.